After we left The Ferret Inn, we were off to Woodmont, Maryland, to Frisky’s Wildlife and Primate Sanctuary, another beneficiary of a contribution from my Oticon prize. Run by Colleen Layton and Scott Robbins, Frisky’s is a private wildlife sanctuary, state licensed rehabilitator, and a 501(c)3 non-profit organization. 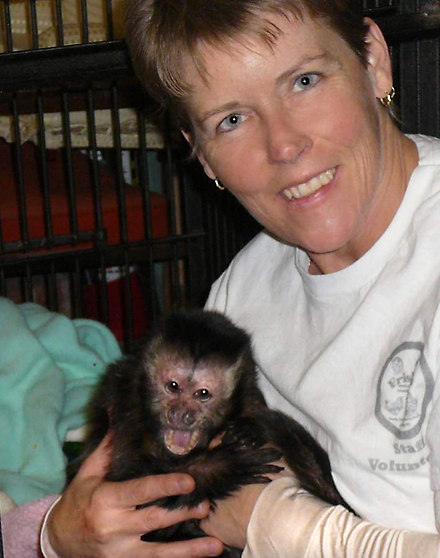 Both Colleen and Scott work full time jobs in addition to caring for the animals and grounds of their 5-acre property. Since 1970, the sanctuary has cared for injured and orphaned wildlife, domestic animals such as rabbits and farm animals whose owners can no longer care for them, and primates that come from sanctuaries or private owners from across the country. When we arrived at the sanctuary, we were met by Colleen and one of her invaluable volunteers, Joyce. Joyce introduced us to many of the primates, spending time with each and telling us a little about them, including names, disposition, and why they do not make good pets. 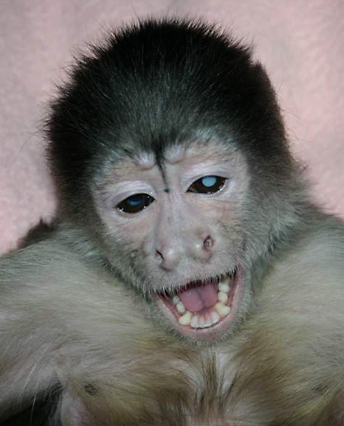 A sweet infant monkey will grow into a difficult adult—becoming the wild animal it was meant to be. That’s why so many of them end up in sanctuaries like Frisky’s. A pet monkey is expensive to house and feed, and, if a monkey is well cared for, it can live 20-40 years. That’s a long term commitment! Read Monkey Matters Magazine‘s article, Pet Monkey: A Reality Check, and National Geographic‘s article on The Perils of Keeping Monkeys as Pets. One of the more lively ones was Oogie, a White-faced Cinnamon Capuchin who was featured on Animal Planet’s “Pet Psychic.” Oogie came to the sanctuary nearly blind, with cataracts in both eyes. Because of the high cost of this type of surgery, only her right eye could be operated on. During her recent physical, they discovered she is losing the sight in that eye. Frisky’s is hoping to raise funds to operate on the left eye to save her remaining eyesight. If you would like to help, consider donating to Frisky‘s. FYI: As instructed, we kept the “two foot rule” of space between us and all the primates. We were especially mindful of Oogie, who kept tossing things out of her cage at us whenever we passed by. I think I would do the same if I had poor eyesight! Currently at the sanctuary there are 24 monkeys, two Coatimundi, a Cocktoo, four Cockatiels, two African Grey Parrots, two adorable long-haired goats, a Mink, and various guinea pigs, rabbits and birds (many Zebra Finches and two Goffin Cockatoos). The Guinea pigs and rabbits are available for adoption as are most of the birds (except for the African Grey Parrots). The mink, Trixie, is about five years old and was found in the woods by someone who thought she was a ferret. She cannot be released. Joyce and her husband, Matt, love taking care of the two Coatimundi and are the only volunteers that work with them since they have bonded with them. Weeble is a 12 year old male and was a product of divorce. He ended up with the wife, and when she couldn’t handle him, she had him declawed in hopes it would work. It didn’t, so she turned him over to Frisky’s. The female, Katia, is 14 years old. Her family moved to the area eight years ago and when they took her to a vet for her yearly physical, they discovered it was illegal to own a Coatimundi in Maryland. Katia found a loving home at Frisky’s. 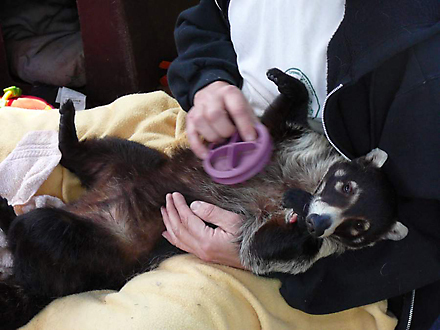 Joyce provided this photo of Weebles being brushed by Matt, as well as the photos of Bimbo (shown in her cage with Joyce) and Oogie. Joyce also introduced us to Bimbo, one of the oldest primates at Frisky’s. Affectionately known as the resident grandmother, Bimbo arrived at the sanctuary from Pennsylvania in April 2000, shortly after her owner died. Since she was domesticated, she could not be placed in a zoo. Now 37 years old, she has gained a bit of celebrity status in Maryland. Find out what her special talent is here. The monkey pictured below is Grisha, a Marmoset. He is about four years old and was surrendered when his owner could no longer handle him. Exotics, as a rule, do not make good pets. And this is especially true with monkeys. Joyce said owners think if they get them when they’re young, they will bond with them, and that’s not usually the case. As they get older, they become more, well, monkey-like…and they treat you like they would another monkey. Anything goes! This is why so many exotic animals end up in sanctuaries like Frisky’s. Also pictured is Sweetie, a beautiful white Cockatoo. Sweetie is 14 years old and was the product of divorce. Sweetie gave us a quite a performance, dancing and cooing as Colleen sang to him. Afterwards, I got some sweet shots of him cuddling with Colleen. One of my favorite sanctuary residents was Jackie, a Vervet Guenon. Her cage was filled with stuffed animals, most numerous were her teddy bears, which she treats like they are her babies. She loves to look at herself in the mirror and I got the shot below showing her doing just that. She stroked and preened several of the stuffed animals and made funny grunting noises while she did it. She seemed very docile and sweet. The adorable goats pictured below (Dennis, white and Dominic, black) are Pygmy goats, born in 1993. Dominic loves to stand on a metal drainage cover in the middle of the yard. Joyce isn’t sure if it’s because it’s drier than the grass or if he just feels like he’s on a throne! Dennis and Dominic came from a breeder. Their mother had given birth to four babies and that apparently was more than she could handle. She tried to gouge out one of Dennis’ eyes and chewed off part of his ear. The breeder decided to take him to Frisky’s to save him and ended up sending two goats. Both had internal and external parasites when they arrived. Colleen said the vet named Dennis after “Dennis the Menace” and said he was in so much trouble but came out all right in the end! Frisky’s does not receive any county, state, or federal funding. The sanctuary survives only by public donations. Frisky’s is enrolled in two charity campaigns: Combined Federal Campaign Code #37712 and Maryland Charity Campaign Code #7150. Donations are tax deductible to the fullest extent of the law. Frisky’s has no paid employees, so every dollar you give goes directly to help care for the animals. Consider sending a check or donating items on the wish list. Most of the items on the list are simple and inexpensive. Every little bit helps! Frisky’s website is full of great information, such as things to consider when adopting any pet, tips for saving spring wildlife, information on how you can volunteer, and there is even a donation wish list for items needed to keep the sanctuary thriving. I noticed some of their “most needed items” were bird, guinea pig, rabbit, and hamster food, as well as Timothy hay, so I picked up a few items at Petco to donate in addition to the check. Frisky’s is located at 10790 Old Frederick Road, in Woodstock, Maryland. Tours and groups for educational purposes can be arranged, but only by appointment. Colleen can be reached via phone at 410/418-8899, fax 410/418-5402, and e-mail at friskyswildlife@yahoo.com. For directions to the sanctuary, click here. The 1/10 mile long driveway to the sanctuary is lined on both sides by 80 foot high pine trees—a really majestic entrance! Frisky’s accepts all wildlife—regardless of physical condition, mental handicaps, or problems—providing the best care, medicine, and food to each animal as soon as it arrives. As soon as they are physically fit, Frisky’s will return the animal back to nature or the State Park. If the animal is domestic, Frisky’s will find adoptive homes. On the website, Colleen describes the sanctuary residents: “If it’s not sick, orphaned, or mentally or physically handicapped, then it does not belong here.” She jokingly includes herself in this description, saying, “You would have to be crazy to live like this.” She wouldn’t have it any other way, nor would she accept a paycheck for the work she does. Thank you, Colleen and Joyce, for the wonderful insight into what you do for all these animals! Yesterday Michael and I drove up to Columbia, Maryland, to meet Nancy Wilson, who operates The Ferret Inn. The Ferret Inn Rescue & Shelter was one of five non-profit animal organizations that will receive a portion of the charitable contribution I was awarded by Oticon last month in Denver. Oticon is a leading hearing aid manufacturer and I won a Focus on People award in the adult category in this year’s awards program. Learn more about the 2008 Focus on People awards event from my posting here and see Oticon’s recent press release here. Barbara Kelley nominated me for the award. Barbara is the editor of Hearing Loss Magazine, which I design and produce bimonthly for the Hearing Loss Association of America. Our most recent cover feature was Reed Doughty of the Washington Redskins. I have chosen to donate my charitable contribution from Oticon to several animal-focused groups in honor of my very dear and greatly missed friend, George Hope Ledbetter, who passed away a year ago this November 9. 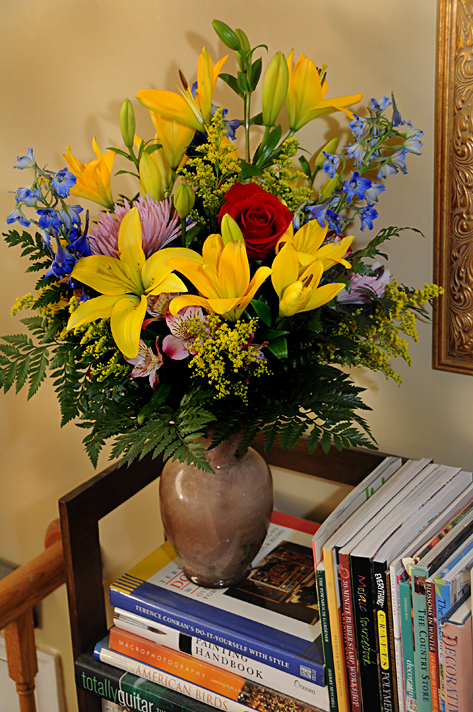 George loved animals (as does his wife, Carmen) and I wanted to do something special to honor his memory. The other designees are Gene Baur’s Farm Sanctuary in upstate New York; Happy Tonics, Inc. in Shell Lake, Wisconsin; Wild Bunch Wildlife Rehabilitation, in Alexandria, Virginia; and Frisky’s Wildlife and Primate Sanctuary in Woodstock, Maryland. 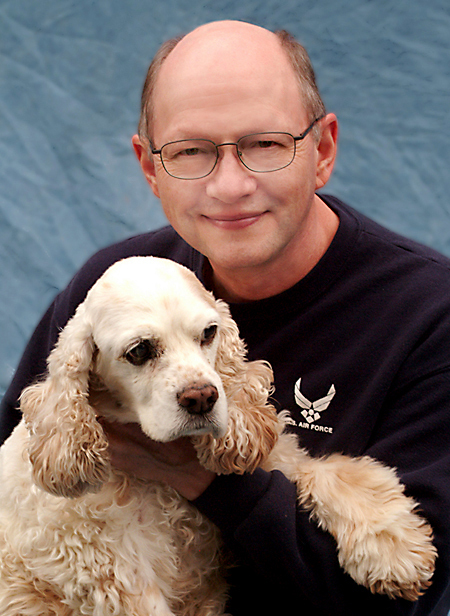 I shot the photograph below of George, with his beloved cocker spaniel, Angus, just after George retired from the Air Force. Since The Ferret Inn is only about an hour away, I called Nancy to ask if I could present the check in person and see her operation. Michael and I had eight ferrets from about 1992-2004 and although we are ferret-less now, they still hold a special place in our hearts. On the way to Columbia, we stopped at Petco to pick up some ferret treats, a hammock, and some toys as an extra donation. Nancy and her husband, Tom, operate the shelter and currently take care of 60 ferrets (down from 80!). They had a recent influx of 21 ferrets who arrived via a research facility. Two have since found their “forever homes.” In the first photo below, Nancy is surrounded by some of those ferrets. The Ferret Inn has a staff of devoted volunteers to tend to these wonderful little critters. Nancy’s cat, Joey, competed for our attention and served as a sentry for this business of ferrets. (Did you know that a group of ferrets is called a “business” of ferrets?). Michael named our first ferret Bandit—because of the mask around his eyes. If you know anything about ferrets, naming a masked ferret “Bandit” is about as generic and unoriginal as you can get. We did get better with names as time went by, though. One of our most rambunctious ferrets was named “Pogo Diablo”—translated as “Jumping Devil.” And that he most certainly was. Our ferret names, in order of acquisition, were: Bandit, Silver (another unoriginal name, silver is the name for a particular ferret coloring), Missy, Callie Jo, Ben, Pogo Diablo, Jessie Bell, and Ginger (yet another name for a particular ferret coloring). Jessie Bell and Ginger were adoptees from the Alexandria Animal Shelter. The shelter presently has six beautiful ferrets up for adoption here. The cages at The Ferret Inn were labeled with fun names such as Napster, Jezebel, Peaches & Herb, Snickers, Jackie-O, Hunny, Cotton, Kitty & Kat, Shark (ferrets are commonly called “carpet sharks”), Bonnie & Clyde, Isis, Calypso, and Thelma & Louise (one of which is featured below, pulling her stuffed toy into a crinkle tube). Thelma & Louise were rescued from a “ferret mill” in Ohio, just two of more than 600 that were rescued and placed in rescue shelters across the country! Nancy’s ferrets are clearly well-loved, happy, and healthy. Click here to see other ferrets up for adoption at The Ferret Inn. The Ferret Inn is an approved 501(c)(3) non-profit and has been in operation since 1999. They specialize in ferret rescue, placement, and boarding. Since their inception, they have placed approximately 900 ferrets. If you want to learn more about ferrets or might consider adopting one (or two! ), call Nancy at 410/531-4936 between 8:00 a.m. and 5:00 p.m. EST, or e-mail ferretpassion@verizon.net. There is an adoption application available for download here. The Ferret Inn also has ongoing opportunities for volunteers—click here for details. Can’t adopt right now? Then consider donating to The Ferret Inn! Donations help offset high veterinary costs and keep the ferrets healthy and happy until they find their “forever homes.” Every little bit counts. The Ferret Inn takes donations via credit cards and through PayPal on their website here. Michael and I noticed the beautiful fall color around this retention pond—less than a mile away from our home—so we hurried back home to grab our photo gear and go back to capture some images. The light was glorious, the weather was mild, and the wildlife was most cooperative. Last year the leaves peaked for us much later (Nov. 17), so one afternoon I took advantage of the perfect light and shot some images in our neighborhood. See those photos in my posting here. And for something completely unrelated…if you’re a football fan (especially of the Washington Redskins), click here for a recent posting on my main blog. I had the opportunity to photograph a player at Redskins Park a few months ago!